VerTerra Eco-Friendly Party-Ready Plates — 6” x 6” disposable plates created from fallen palm leaves, gathered and pressed into distinctive shapes. Using fair wage labor and sustainable production methods VerTerra is the elegant, guilt-free choice to help make a difference in the world one party at a time. Aspenware Biodegradable Wood Utensils — Biodegradable and made from birch and aspen — hardwoods that are ordinarily burnt or left to rot during regular industrial logging. SKOY Cloth — A fabulous, absorbent, biodegradable and natural multi-use cloth. These re-usable earth friendly cloths are perfect in your kitchen, bathroom, and on most surface areas in your home or office. SKOY cloth can be used in place of your sponge, wash cloth or paper towels. I’ve used Verterra plates and Aspen Wun utensils before, and I love them. The SKOY cloth is new to me, and I love how they replace paper towels, and item that still remains in my kitchen and keeps me on the dark side of eco-living. 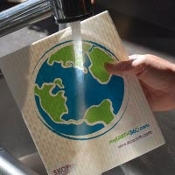 Just one SKOY cloth replaces 15 sheets of paper towels! It is a European made product and 100% biodegradable because it is made from a natural cotton and wood-based cellulose pulp. SKOY cloth is a chlorine-free product using water-based colors and inks. After an independent composting test, SKOY cloth broke down completely within 5 weeks. The SKOY cloth has an absorption factor of 15x its own weight. As a result, producing the most superior cloth product available. Imagine using 15 sheets of good-quality paper towels at once? This is how a wet SKOY cloth will feel in your hand. If you are interested in any of these products, myEARTH360 is a great place to discover eco-friendly products for daily living. The skoy cloth is great!!! We use them as a replacement for paper towels, sponges and traditional clothes. Wipe down counters, wipe off the kids, drying dishes, etc… They do last a long time and are SUPER absorbent. Great product. I started using Skoy after I read the review in Cooks Illustrated. They compared a few different earth friendly cloths but Skoy was their fist choice. I ordered some and now I know why. They last about two months in the kitchen, then I put them in the bathroom, and finally out to the garage to clean the car / dog. When they really do get tired I let them dry and run them through my paper shredder, and add to my worm bin. Try do that with a synthetic cloth (It’s a ShamWoops) and see what the worms think! Great article… People should always think about what’s disposable and what isn’t.